Rope Access is a manual system of providing access which, by virtue of diversity of equipment & specialised techniques, allows access to many difficult locations. Industrial Rope Access utilities techniques adapted from mountaineering, rock-climbing, caving & abseiling for use in industrial applications. With strict controls in place to ensure quality of training, on-site administration & work procedures, these systems provide a means on access that offers a high degree of safety. Industrial Rope Access has been established in Australia for approximately 10 years & in Europe for over 20 years. This method of work positions has been carefully refined over the years by the Australian Industrial Rope Access Trade Association (IRATA) in the United Kingdom & more recently adapted by the Australian Industrial Rope Access Standard (AIRA) for work in Queensland. RAS is committed to the on-going development & implementation of safe work positioning using these systems. Rope Access Solutions is recognised as being on the leading edge of height access and safety in Queensland. Providing competent rope access technicians who have been trained to the highest industrial rope access standards. Ensuring an innovative and cost-effective solution to difficult to reach locations on building and structures. Using only the best quality and most appropriate equipment available on the market today. Compliance with the relevant codes, standards and industry regulations at all times. Please Note – To comply with Building services Authority (BSA) Rope Access Solutions is allowed to perform building service work to the value of $3300. Cleaning services can be done to any value. 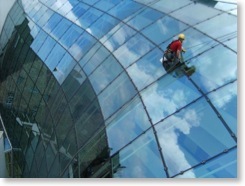 For building services work above $3300, Rope Access Solutions has a sister company called Access Maintenance and Repairs www.accessmr.com.au with the required BSA licence to perform building services work to any value. Both businesses are proudly managed by the same professional team.